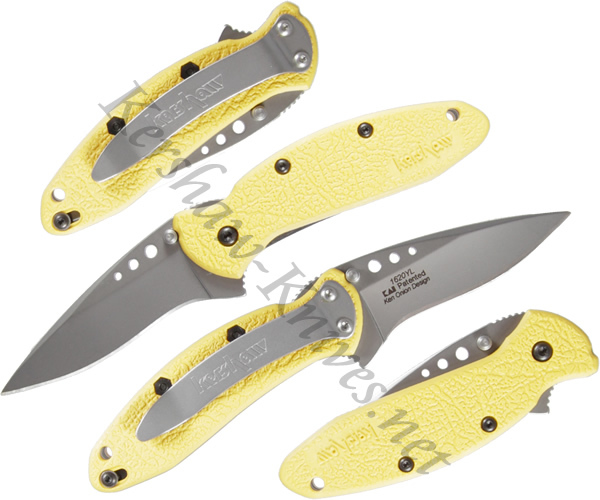 If you are the type that misplaces your knife and needs it to call out to you when you lose it then you might try this yellow Kershaw Scallion model 1620YL. It is just like all of the other USA made Scallions with the exception that it has a bright yellow handle. This makes the knife stand out a little more amongst the clutter or in low-light conditions. The Kershaw Scallion has an assisted opening blade that is locked with a liner lock in the handle. A pocket cliip is mounted on the knife for easy carrying inside the pocket or out.